Exotic but practical, Tibetan singing bowls have many uses. Tibetan Singing Bowls have been used for centuries on the ancient Tibetan plateau. Also known as Himalayan singing bowls, they are widely used in spiritual traditions such as Buddhism and Hinduism. Monks, Nuns and lay Buddhists use them in rituals, prayers and in meditation in Tibet and in the communities in exile. Courtesy of Bodhisattva Trading Co. 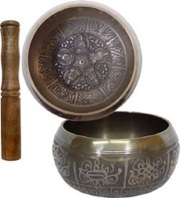 The multiple overtones of the singing bowl are well known for their health benefits. They relieve stress and tension and give a sense of happiness and well being. Therefore they are used in many kinds of therapeutic healing techniques. I once knew an overweight American woman who used a brass Tibetan singing bowl to control her hunger. I'm not kidding. She placed it on top of the fridge. Whenever she got an unreasonable urge to eat food between meals, she just tapped the bowl with the beater, closed her eyes and reminded herself that she controlled her mind and body and not the other way around. I am happy to report that she lost a good amount of weight by doing this! I also met another woman in India that used a very fancy one as a fruit bowl! She was quite rich and not very spiritual I'm afraid! You can buy cute little cushions in bright colored brocade to set the bowls on. You also need a singing bowl beater or striker which is usually included with the bowl. It is a wooden or leather wrapped piece of wood that you hit the bowl with. eight auspicious symbols on them. It's very easy to learn how to use or play the Singing Bowl by watching these Tibetan Singing Bowls Videos. By rubbing singing bowls with a wooden or leather wrapped singing bowl striker while the singing bowl rests in your palm, the rim of the singing bowl vibrates to produce a calming sound (or hum). Each singing bowl comes with a striker (the stick for playing the singing bowl). You can just meditate on the sound or vibration or you can repeat mantras while the bowl is resonating. 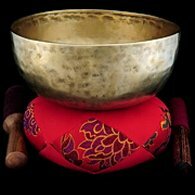 Some meditation and yoga classes begin and end with the sound of a singing bowl. You can also repeat a prayer or mantra while tapping the beat with the striker on the side of the bowl. Some people experiment with different sounds by filling the bowls with different amounts of water. Try your own experiments, the possibilities are endless! Want to make your very own web page on Tibetan life?